Utilizing a miniature Vaccon venturi vacuum pump as its vacuum source, the vacuum pencil kit includes a vacuum pump, vacuum pencil and a variety of interchangeable ultra-mini cups and probes. 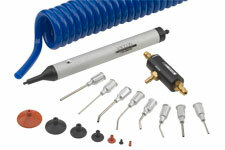 Vaccon’s Vacuum Pencil easily adapts to handling different objects by simply changing the Vacuum cup and probe. Lightweight and compact, the vacuum pencil kit is ideal for bench top work. Ideal applications include electronics, glass handling, high temperature, medical, and miniature assembly operations. The kit is lightweight, quiet, easy to assemble (no tools required) and flexible – change cups or probes for different applications. for simple, manual placement of small parts. See ultra-miniature cups above.